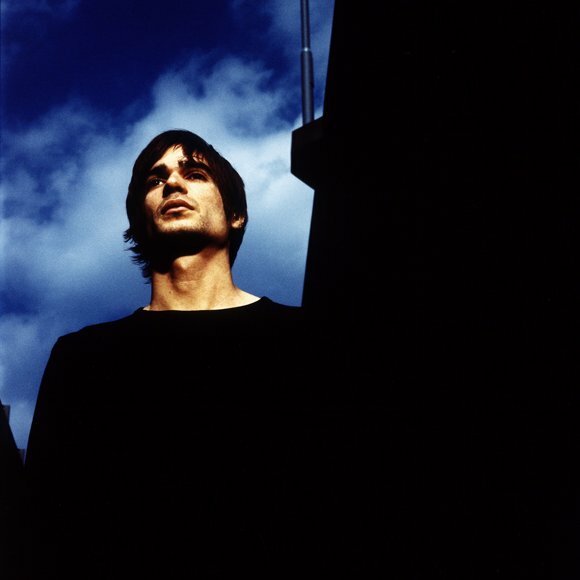 Jon Hopkins performs live at the ICA. Photo (CC-BY-SA) Matt Biddulph. 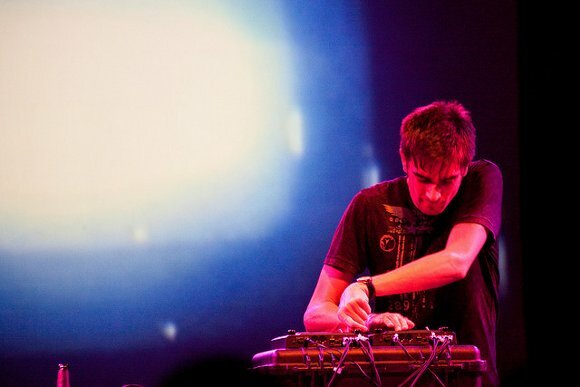 Classically trained as a pianist, musician and producer Jon Hopkins has one of the richest resumes in electronic music. He’s a frequent collaborator with Brian Eno, wand has worked with artists like Coldplay (who featured his music on their last album), Tunng, David Holmes, and Imogen Heap. He worked with director Peter Jackson, and has a sci-fi score on the way. He also has a rich set of solo releases. 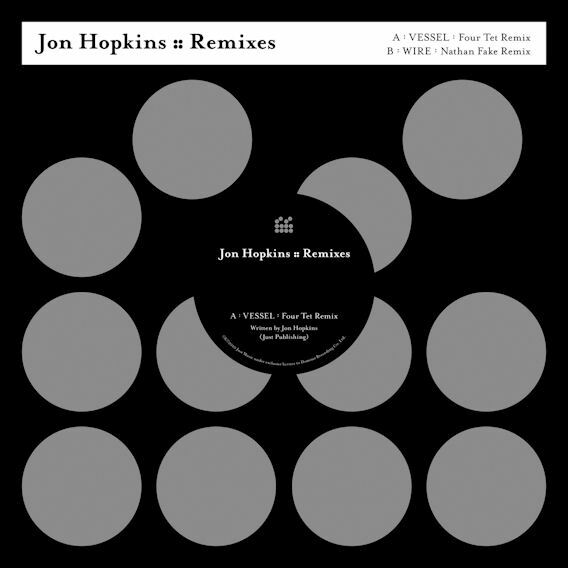 And we’ve seen him here recently with remix swaps with Four Tet and contributions to Eno’s upcoming Warp record. Coming to the Electric Zoo Festival, the blowout Randall’s Island Labor Day weekend electronic party here in New York, he’s set to perform a straight-up, genuinely live set, complete with a small squadron of KAOSS Pads. You can catch him Sunday at 1pm if you’re at the event. I got a chance to speak to Mr. Hopkins by phone from the UK, before he departed for New York and Electric Zoo. 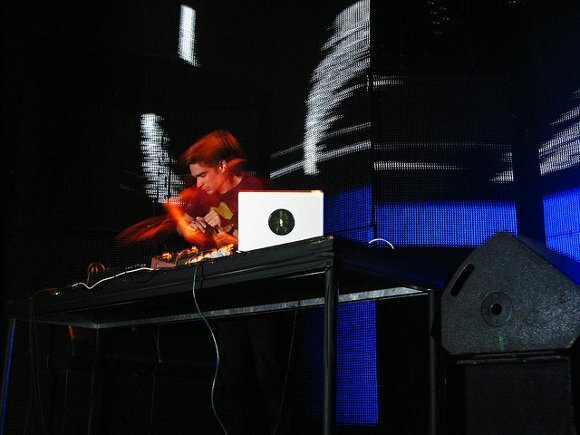 He shares here how he works live onstage and in the studio, talks about how Brian Eno got him hooked on the Kaoss Pad, and reveals his addiction to the tools he first used as a keyboard and resistance to software and hardware upgrades. I’m especially able to resonate with what he has to say about working with sound, and transitioning from a piano background to working as a producer – and I’m listening to his work from a fresh perspective after the combination. CDM: Not having seen your live show, knowing only your studio work, I’m looking forward to seeing you at Electric Zoo. Can you tell us a little bit about what you do for live sets? Hopkins: It’s an Ableton [Live] system at the core of it. I ran off all the separate sounds from my own studio, and kind of loaded everything up into Ableton, so I’ve got total flexibility over all the songs. Then I have separate outputs through the interface, so I can have four or five [Korg] Kaoss Pads running in sync with Ableton, where I can do sampling and looping and all kinds of crazy sounds. And then I go into a mixing desk, and I’ve got a lot of control over what’s going on. I’ve got a little MIDI keyboard up there to play stuff on and to keep things triggering. That’s kind of it, really. It’s not enormously complex, because I have to be able to travel around with it on my own. How do you use the multiple Kaoss effects in tandem? The card I use has 16 outputs, so I can separate sounds into different ones and have different effects running on each pad. And sometimes I put one at the end to control the master. It depends. It’s a very flexible setup that way. In order to assemble your clips, are you simply loading stems from the tracks into Live? Loops, stem loops, and a little bit of everything. One-shot things, longer things. It’s kind of really just about having a variety, so you can take it any way you feel. I found out recently I’m playing for an hour and half rather than an hour [at Electric Zoo], and I normally do an hour, so there may be some slightly longer pieces. I’ve got some time to prepare, so I’ll go and revisit some other songs and try to bring some new things over, as well. So it should be interesting. Otherwise, it sounds like the live set is mostly dry; you’re doing most of the processing on the KAOSS Pads. Yeah. Those things – the Kaoss Pad [KP3], specifically — I was working with Brian Eno over the years and he showed me the original one when it first came out, and I’ve kind of followed them as they go. And seeing from him, some of the crazy things he can do with them — I’ve just gotten really addicted to them. You can kind of make them do things they’re not supposed to do. If you record things into the delay settings, particularly the loop settings, and then speed up the tempo, the craziest effects come out. If you got that going into another one, you end up with a sound onstage that you’d never get out of a computer. It’s cool. Hopkins at MUTEK earlier this year. Photo (CC-BY-SA) basic_sounds. Let’s talk about the new single, and the work with Kieran [Hebden / Four Tet]. How did that come about? Well, we met about three years ago, I think. We had quite a lot of mutual friends. I had been a bit of remixing for an artist on Domino called James Yorkston, who he’d worked with, as well. A year or two later, I signed to Domino. We did a show together at the Natural History Museum in New York, and it was our first show together – a year and a half ago or something. And the mix of styles went quite well, I think. And we did a few more, and we did a remix swap recently. I did one for his last single, “Angel Echoes,” with the Caribou remix on the other side. And he did one for my new single, which is “Vessel.” And now we have this tour together in October, which I look forward to very much. How do you approach working with his sound, or approach the remix as opposed to your solo work? It was great, actually, because I love the original. I loved his last album [There Is Love in You] — it was fantastic. The first time I heard it, a guy from Domino played me some of the tracks in the car, way before it was out. And I heard that song, and I just had this idea for it, which was to take that vocal out of the chords he had it in, and write a completely new chord sequence on the piano — have a very natural piano sound, and then have those vocals and those beats flow back in on top of that, and really just try to rewrite the whole chord structure. And he had a live drum loop in there, and I found that if I really squashed it with a limiter … you heard every tiny detail of it. I added an extra few snares here and there, and turned it into a real 3/4 kind of thing, a dance track. And then the main sound — the track was called “Angel Echoes.” I’ve got an old Eventide DSP 4000, which has got a setting called Angel Echoes — which is a complete coincidence; he had never heard of it. I tried putting all the vocals through this Angel Echoes patch and then sent the pitches up an octave and down an octave, as you can with the Eventide in a quite interesting way. There’s this sort of enormous, floating delay. And I had that filtering up in the background while the dry vocals play over top. So you can hear a lot of that effect in the song, particularly in the end. So that was that track. It seems like the combination really works naturally, that there’s some common aesthetic between the two of you. There’s some common ground in there, yes. Also… my early albums are completely different than his. I think we’ve grown closer over the years. I think it’s a nice combination, because we have some areas in which we’re similar, and some in which we’re completely different. What’s your studio setup look like, aside from obviously the aforementioned Eventide? I’ve got quite a strange combination of things. The core of it is now a Logic system. But I’ve only had it for about a couple of months. Everything I’ve actually released so far was done on Cubase VST from about — I don’t know, 2001 edition; I can’t remember what number it was. And all the sounds I’ve made over the years have been on SoundForge, which is a program I’ve just always loved. I’ve been using it since I was 19; I just got so used to it. I guess it’s whatever program you know best is the best one there is, really. I don’t think there’s huge amounts of difference between one sound editor and another. I’m sure they all can do similar things. But I’ve loved the way SoundForge just has the one massive waveform on the screen, and you can just have infinite levels of undo on every spearate sound. And I have that going into Cubase, so you can have these sounds kind of open live, and be changing them all the way through the process of the song. Just recently, I worked on a film soundtrack, and I found that system finally couldn’t quite handle having any video, so it started crashing a lot. So I’ve got this new Logic system, but I just can’t make any of the more complex sounds on that, because it takes so long. So what I’ve done is hook them up together with an Ethernet cable so now I can drop certain sounds in a folder and have them open in SoundForge and then drop them back in Logic. So I’m using them both, really. And that’s great. I didn’t want to just completely lose all that, because I think that is what has defined the sounds I’ve been making over the years. I don’t want to change everything in one go. It just seemed like a step backwards in some way. There’s something psychological about it too, right, when you’ve done a lot of work to have it look familiar? It seems you feel differently about that tool. You do, I think so, yeah. And particularly when I started on Logic and hooked the two up, I just felt quite bewildered as to how I would ever reach the complexity of editing levels that I was used to. I just operate directly on the waveform. And I love that what you see there on the screen is what you’re hearing, rather than it going through a bunch of live plug-ins. It’s just what I’m used to, really. So, what don’t you do on the level of the waveform? At what point do you decide, okay, I’m done with that level of granularity with the waveforms and now I’m ready to work with effects and mixing? I think initially, you go by instinct. In SoundForge, I’d have three or four variations of a loop, and then they would be open in Cubase, or now Logic. And you’d be able to operate on little micro-edits. And then at some point, you feel the drum track is ready, and it doesn’t need any more tweaks — it would be overworked. And I don’t like over-programmed electronic music; I think it had its time, really. Now I really think a solid groove is the way. And it’s great, at that point you can stick it in Logic. I invested in some crazy plugins, so I’ve got quite a lot of fun things going on in there. Hopefully it will evolve to be the best of both worlds. Image courtesy The Windish Agency. And you work a lot with the keyboard, coming at this as a pianist, as well? Yeah. I didn’t mention that the only keyboard I’ve ever used is a Korg Trinity. I’m sure there aren’t many around these days, but again, like with SoundForge I don’t think it’s about what you use, it’s about how well you know it and how long you’ve been using it. And I know that machine ridiculously well. I’ve had it again since my first setup, when I was 18. And I’ve got a few hundred sounds that I’ve made over the years. Every synth sound on all three of my albums comes from that, with the exception of a couple of bass sounds from a Nord Lead that I’ve got as well. But it just gets enormously processed. I don’t use them as they are; I stick them into SoundForge and just mess them up, and go through a lot of processes.On the new album, a lot more of the sounds that sound like synths are actually real instruments that have been mangled. A lot of the things that sound like synth pads are actually where I was playing piano through a series of pitch things into quite a deep reverb, and I was using that with a kind of gate to make a lot of the pads and the rhythmic sounds. You do have a piano in your studio, as well, I would imagine. It’s, like, behind me when I’m sitting at the computer, so I can swivel around on the chair I can play it. It’s hooked up to a couple of mics, [which] goes into a nice old TL Audio valve pre-amp thing, which then goes into either SoundForge or into Logic, depending on what I’m working on. It’s the same piano I’ve had since I was a kid, so it’s nice for me, it’s in good condition. Do you find that piano practice or piano technique are still sort of part of your musical life? No, unfortunately not; it’s gone. (laughs) I can only play what I need for myself. I used to be a clasically-trained pianist when I was a teenager. I guess it stopped when I was 17; I realize I wasn’t interested in pursuing that, because as a career, I wanted to make my own things. I used to play a lot of technical stuff which is unfortunately gone. But I couldn’t really justify sitting there and practicing for two hours a day, which is what I used to do. Once you work on musica all the time, music in your spare time isn’t really something you want to do. Oh yeah. It’s very much limited to the exact thing that I need, but I can still do exactly what I want to hear on what I’m recording. The thing that hasn’t gone is the dynamic range, so I can still play very quietly if I need to, or generally stay in time. It’s just anything fast — but I would never have anything like that anyway, because it’s not really what I’m into playing-wise or writing-wise. Do you find you draw on the Classical background that you have? Yes it is, although in a very subliminal way. I haven’t played a Classical piece on the piano since 1998, so whatever’s left — I think I’m more influenced by film scores and what appeals in them, which in turn I guess are influenced classically. But there’s certainly no conscious reference between what I used to listen to and what I used to perform and what I write now. Next up: a remix 12″ from Domino, with Nathan Fake and Four Tet. (pauses) My mind always goes blank when that question comes up. Me, too — or I could say, in the last 72 hours? (laughs) Actually I think I’ve got my iPod right here. I’ve been listening to a friend of mine, Nathan Fake of Border Communities, who did the other remix of my single. Been listening to his stuff, his album Hard Islands. I do tend to listen to stuff that people I work with or who are friends of mine. I listen to a lot of Brian Eno, very specifically the ambient series. I love all of that stuff. You kind of never get bored of that, really. But I’m also into a lot of songs and more traditional singer stuff like Arthur Russell or Jim Martin, people like that. Proper lyrics I love, as well, almost listen to more of that than electronic stuff. And then you had the experience of Monsters, the sci-fi film. That was an amazing experience. I don’t know when it comes out in the US, but it comes out in the UK 12th of November. It was the first film I’ve worked on just on my own. Ed. : Hopkins is no stranger to film scoring by way of collaboration, having scored Peter Jackson’s The Lovely Bones with Brian Eno. And we’re in luck here in the US – the movie arrives October 29, on demand even sooner on September 24. And there should be a soundtrack album that comes with that. It’s very much more cinematic style, no beats, much more pure melody and atmosphere and tension. So it doesn’t sound like any of my albums, really. It’s interesting to be pushed in different directions by whatever you’re working on. Had you had the experience of thinking about visual ideas when you worked on music before? I know it’s very different when you have someone else’s image there in front of you. No, that was a whole new thing, because I actually don’t tend to think particularly visually. I always wanted videos to get made – but you don’t really get those kind of budgets any more. So I don’t tend to think of anything in particular when I’m writing. I just follow the instinct of the melody and where it goes. So it’s almost like having a film in there takes an enormous part of the pressure and responsibility off, because you’re not the main focus. How slavish were you in terms of how you lined things up? Pretty specific. I mean, it was my first time on my own, as I said, doing it. So I pretty much was feeling my way; even simple things like how to arrange the sessions on the computer for each queue — it would have been useful to know that you should have a different session for every queue, because I was trying to do it in one and thinking, wow… (laughs) Just simple organization was quite difficult. I guess the learning curve is administrative as well as creative! And it went really well in the end. I was working very strange working hours of 2pm to 4am every single day, and sleeping very strange hours, and not doing anything else. It was the middle of winter, and I barely saw daylight. Life is very simple when that’s all you’re doing. You just feel like for that period of time, you’re not thinking of anything else. I manage to take care of everything else that comes up and come in every day and fight through to the end, really. It was an amazing experience. It’s starting to pick up some great momentum, so we’re really excited about it coming out.